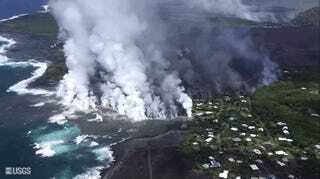 Lava reached Kapoho Bay on Monday and destroyed hundreds of homes overnight. Kilauea’s lava has continued to spread its fiery tentacles over the Big Island. Overnight on Monday, lava reached the sea near Kapoho Bay. As dawn rose on Tuesday, it became clear that it had consumed hundreds of houses to get there. Kilauea’s East Rift Zone has been the site of an ongoing eruption for weeks. Lava initially threatened the Leilani Estates neighborhood located a little more than five miles to the west of where the current destruction is taking place. While eruptions continue in that area, the front of the lava flows has pushed northeast toward Kapoho Bay and the neighborhoods of Kapoho Beach Lots and Vactionland. 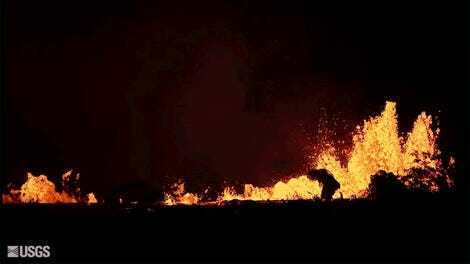 Hawaiian authorities warned residents there to evacuate last week as lava continued its inexorable march. It seems they had good reason to do so. Video released by the U.S. Geological Survey showed lava rushing into Kapoho Bay on Monday, sending up noxious clouds of steam, hydrochloric acid, and particulate matter called “laze.” Many residents chose to evacuate before the lava made it to the water, which is why there have been no reported injuries. But a flyover on Tuesday revealed widespread devastation. “We don’t have an estimate yet, but safe to say that hundreds of homes were lost in Kapoho Beach Lots and Vacationland last night,” Janet Snyder, a spokeswoman for Hawaii County, said according to an AP report. As of 6:30 a.m. local time, lava extended up to 0.7 miles out into the bay, according to the Hawaiian Volcano Observatory. The new land it’s forming will belong to the state once it cools, but that’s small consolation to the people who called the former beachfront neighborhoods home. The eruption at Kilauea has been ongoing for more than a month and has resulted in everything from glowing blue flames to huge ash clouds to its own weather. Lava caused widespread damage in the Leilani Estates neighborhood located further inland and it will take years for that area as well as others to recover. The Hawaiian Volcano Observatory reports that the “vigorous eruption of lava continues in the lower East Rift Zone” so more damage is possible in the coming days and weeks.